Industry 4.0 is commonly referred to as the fourth industrial revolution. It includes cyber-physical systems, the Internet of things, cloud computing and cognitive computing. 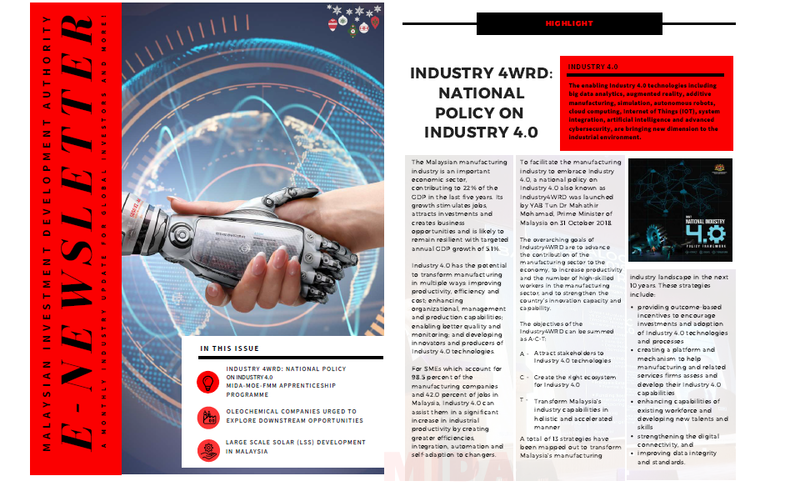 The enabling Industry 4.0 technologies including big data analytics, augmented reality, additive manufacturing, simulation, autonomous robots, cloud computing, Internet of Things (IOT), system integration, artificial intelligence and advanced cybersecurity, are bringing new dimension to the industrial environment. Also, the details of Opportunities for Oleochemical Companies and Large Scale Solar (LSS) Development in Malaysia is inside this brochure. ・Oleochemicals are chemicals derived directly from naturally occurring fats and oils in animal and vegetable sources. ・Solar power has become one of the most significant sources of energy in Malaysia. The Government strive to ramp up the generation of electricity from renewable energy sources since the introduction of the Renewable Energy Act 2011.